A joint venture between CB& I and Kentz Corporation Limited have been awarded a contract for the mechanical, electrical and instrumentation work on the Gorgon Project on Barrow Island, Western Australia. The contract has been awarded to the CB&I Kentz JV by Chevron Australia and has an estimated value of US$ 2.3 billion. The contract scope includes the structural, mechanical, piping, electrical, instrumentation and commissioning support for the construction of three LNG trains, with a total capacity 15 million tpa, including associated utilities and a domestic gas processing and compression plant. The work will be performed by CBI Kentz JV, an integrated joint venture between CB&I (65%) and Kentz (35%). The contract will commence immediately and is scheduled to be complete in 2015. The contract will provide more than 1650 jobs for construction personnel in Western Australia. There is potential for this number to grow. The Gorgon Project is operated by an Australian subsidiary of Chevron and is a joint venture of the Australian subsidiaries of Chevron (approximately 47%), ExxonMobil (25%) and Shell (25%), Osaka Gas (1.25%), Tokyo Gas (1%) and Chubu Electric Power (0.41%). The project will develop the Greater Gorgon gas fields, located between 130km and 200km off the northwest coast of Western Australia. 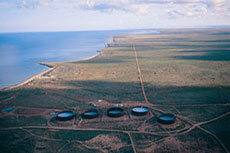 The Greater Gorgon gas fields, Australia’s largest-known gas resource, contain about 40 trillion ft3 of gas.